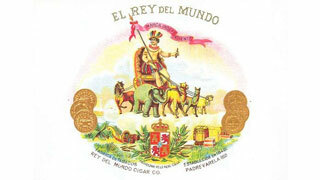 El Rey Del mundo is one of the few cigar brands that fall into the “legendary”category. The brand originated in Cuba in the 1800s and the tradition of high quality hand-made cigars is carried on by the Villazon family in Honduras. Made with a premium selection of Cuban-seed tobaccos grown in Honduras, Nicaragua and the Dominican Republic, giving each cigar a complex, full flavor. Each cigar is finished in either an Ecuadorian Sumatra natural leaf wrapper or a gorgeous dark Maduro Connecticut Broadleaf wrapper. Expertly constructed by the best in the industry, these cigars burn flawlessly and produce a consistent smoke and leathery aroma. The El Rey del Mundo is known for its richness, exploding with spices from start to finish. It’s no wonder the brand has earned itself a high 91 by Cigar Aficionado, and at an unbelievable price, there’s no excuse not to have them in your humidor.